I love eBay. Whenever I see something in a shop I love but cant quite bring myself to pay full price for I head over to the site. It's the same when things eventually sell out and I trawl eBay for hours looking for items from the past. I STILL search for those original Emma Cook for Topshop Boots even though they came out about 8 years ago. eBay is awesome for bagging a bargain and finding new and quirky little things. But sometimes, isn't it all a bit overwhelming? eBay Collections is a exciting new way to shop on eBay! While auctions and trawling through search results are fun and often rewarding, sometimes its nice to just browse. eBay Collections are a pinnable-ish feature that adds a interactive and visual element to shopping. The basic idea is that each collection has a theme and you if you see something you like, you bookmark it by adding it to collection. Then you can go back and look through all your added items and click straight through to buy. All ready and waiting for you! A great feature of the Collections is that you are able to go through and look at what other people are adding to their personal collections or search themes for inspiration. I know a ton of bloggers are doing this campaign, but if you wanted to see mine you can view my Collections here. It's 12 boards all showcasing my current eBay lusts! My personal favourite boards are the Boot Edit (I’ll take one of each in size 5), Little Black Bags and the Skater Chic board. All pretty much sum up my personal style at the moment. I’ll be updating my boards and adding to them regularly so do keep your eye on them and follow them so you can see when new things are added. I think it’s a fun, visual element to the shopping experience. It’s sweet to get inspiration from others and to see what other bargains people are scoping out online! eBay can be a big ol' place sometimes so it's cool seeing what other people are coveting! Not hating but I thought the other week you'd said you had really gone off ebay? I don't recall saying that but do correct me with an exact quote! I've recently bought a pair of boots which I've worn tons recently. I think everyone dips in and out of brands though. I say I'm tired of topshop all the time but wear it in the very next post. Like I said in the post eBay is great but also full of stuff to trawl through! For the for record I do enjoy and use eBay, but doesn't mean I go into phases of being over it then loving it again! I don't think anyone loves something constantly when it comes to shopping. Hope that clarifies things for you! i need to start selling so will be looking up your collections as i go ! Love your collection! Esp. the cool booties and bag. I use eBay for the exact same things – I'm stalking a particular pair of Topshop sandals that are five years old at least, but I still think about them so it must be love! 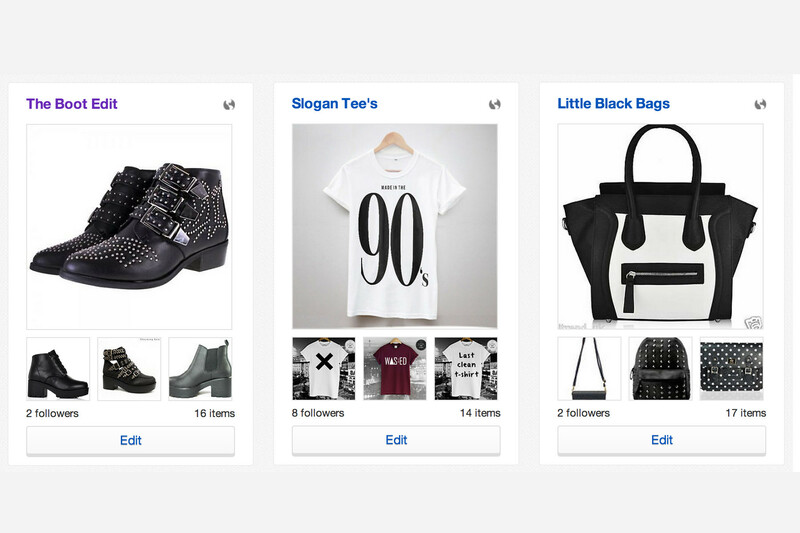 :) The collections feature is fun, like Pinterest for eBay! I love bags, nice collection, I can wear each of them!!! I can easily get addicted to selling stuff on eBay, it is strangely satisfying!!!!!! Very nice list of items ! It's such a good idea aswell :). I love bargain hunting on eBay, great place to find clothes and jewellery cheaper than on the hight street or designer dupes! Love the tshirts so much! Really like this idea! I just wouldn't know where to start with my own! I had fun creating mine as well! It's an exciting new feature!